Crew of B-24J 44-40783 photographed in front of "Tough Titti"
Crew of B-24J 44-40783 photographed in front of "Tough Titti," a B-24J-155-CO serial number 44-40296. 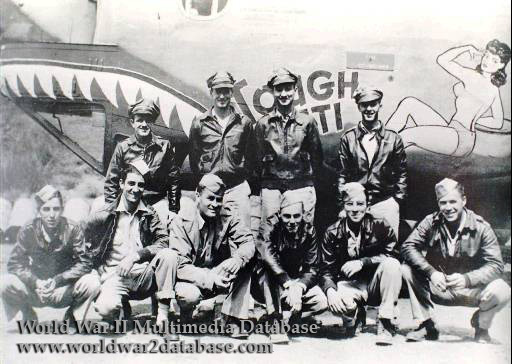 On the evening of August 31, 1944, ten crew members of the 14th Air Force, 308th Bomb Group, 375th Bomb Squadron, lifted off in a Consolidated B-24J-180-CO Liberator serial number 44-40783 from a base in Liuchow, China, on a mission to bomb Japanese ships anchored in Takao Harbor, Formosa. Intercepted by an A6M3 Model 32 Zero-Sen fighter piloted by Chief Petty Officer Takeo Tanimizu of the Tainan Air Group, who shot down B-24J 44-40831 and damaged 40783. On its return flight, it was diverted to an alternate field because Liuchow was under air attack. On its way to the alternate strip, it crashed into Mount Arisan (known as Mount Maoer or Kitten, 6000 feet, 1829 meters) and tumbled into a deep ravine. All aboard were killed. The crew: Pilot, Second Lieutenant George H. Pierpont (Salem, Virginia); Co-Pilot, Second Lieutenant Franklin A. Tomenendale (Shabbona, Illinois); Navigator, Second Lieutenant Robert Deming (Seattle, Washington); Bombardier, Second Lieutenant George A. Ward (Jersey City, New Jersey); Engineer, Staff Sargeant Anthony DeLucia, age 24 (Bradford, Pennsylvania); Radio, Sargeant Ellsworth V. Kelley (Newark, Ohio); Radarman, Private Fred P. Buckley (Garden City, Kansas); Gunner, Staff Sargeant William A. Drager (Washington, New Jersey); Gunner, Sargeant Robert L. Kearsey (McKees Rocks, Pennsylvania); Gunner, Private Vincent J. Netherwood (Kingston, New York), age 20, engaged to be married. On October 2, 1996 two Chinese farmers discovered the crash site 62 miles (100 kilometers) south of Gualin, Guangxi Province. Jiang Zemin, president of the People's Republic of China, presented President Clinton with five identification tags and a video of the crash site during a state visit the next month. The names on the military dog tags included: Buckley, Kelley, Netherwood, Tomenendale and Ward. Four times between 1997 and 1999, a joint U.S.-Chinese team excavated the crash site, recovering numerous pieces of wreckage, personal effects and remains. Using DNA, they identified the crew. Six were buried in Arlington and three in their hometowns.